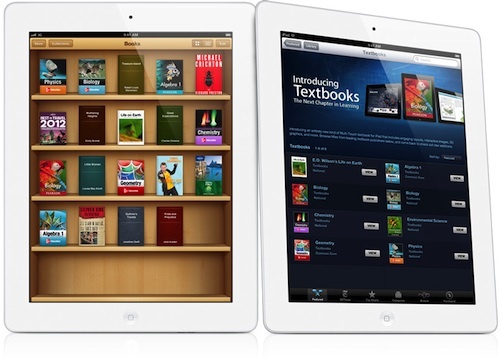 Earlier this month, several sources indicated that Apple will focus on iBooks at its "iPad mini" media event tomorrow, with reports indicating that both personal and education consumption will be of key importance for Apple. Bloomberg Businessweek now profiles Apple's efforts to bring tablets into education, noting that education will indeed be an important theme of the iPad mini unveiling. Beyond the school market of course, Chief Executive Officer Tim Cook will use the device to try to widen Apple’s lead over Amazon.com Inc. and Google Inc. and fend off a more recent threat from Microsoft Corp. in the market for tablets, which NPD DisplaySearch predicts will more than double to $162 billion by 2017. Cook will unveil an iPad with a 7.85-inch screen diagonally, people familiar with its development said in August. The current iPad has a 9.7-inch screen. Yet Apple executives plan to make a point of highlighting the iPad’s educational capabilities at tomorrow’s event, according to a person with knowledge of the planning. Little wonder. Education spending on information technology, including hardware, was about $19.7 billion in the 2010-2011 period, according to the Center for Digital Education. Perhaps supporting the notion of enhanced educational offerings coming to the iPad and iPad mini this week, French site igen.fr reported [Google translation] over the weekend on an iBookstore title showing up with compatibility for an unreleased iBooks 3.0. The Digital Reader later noted that at least half a dozen titles were showing up with the new compatibility requirement, noting that one developer working to create books using Apple's latest tools found that iBooks 3.0 appears set to provide compatibility with the latest EPUB 3 standard at a minimum. Liz Castro connected me with another ebook developer who has been making ebooks for iBooks 3.0 for the past few days. He has been tweeting his progress and one thing he’s already noticed is that iBooks 3.0 appears to offer more Epub3 support. The fixed layout spec in Epub 3 requires the latest version of iBooks, only Apple hasn’t released it yet. iBooks 2 was launched earlier this year with a heavy focus on support for new iBooks Textbooks, interactive digital textbooks intended to revolutionize education, starting with high school textbooks. With iBooks 3, it appears that Apple may be set to take its next steps toward improving that experience even further. I just want to read the books on my Macs. Why would anyone buy something in iBooks? You can only read them on iOS but you still get the same price point as on kindle which is on every tablet, pc or phone. .
Maybe iBooks 3.0 will support a Mac Application too? or you can calm yourself and just get a plastic kindle fire. Why would anyone buy something in iBooks? You can only read them on iOS but you still get the same price point as on kindle which is on every tablet, pc or phone. I aslo think this is failing hard for them, the major textbook they released (and the only one that made it to the german ibooks) never got any of the regular payed updates they promised. Besides the fact that it´s one chapter already was over a gig. It´s to restricted by OS and by current Mobile Datastorage. Finaly give me that new iMac. I need one, i could get an old one but i am not willing to pay a two year old price on it. At what price point? Apple hasn't announced any yet. Also no school or business that buys in bulk pays retail. Prices are negotiated, and often 20-40% below retail. Most companies think of Edu sales as a "loss leader," because students then go home and ask the parents for their own. Cross-platform is the way to go. You gain traction by having availability, which makes the platform feasible (not everyone will buy books if they work on Apple devices only). Then you win people over by having superior experience in your own garden. Just think how much more popular iMessage, FaceTime, Find Friends, etc. would be if they had (even if crappy) clients for other platforms? It'd get people to switch to Apple ecosystem more easily. iBooks looks nice, But I rather use Kindle and read on any device, including the e-ink Kindle itself.